Carbonic anhydrases (CAs) play a significant function in diverse pathological and physiological processes. Their inhibitors and activators are suitable molecules to use as a drug in the treatment of different disease. 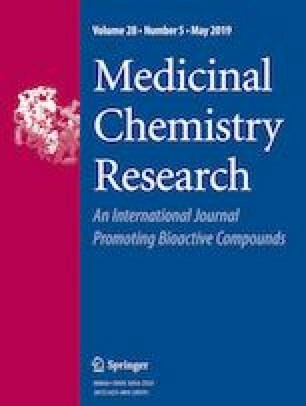 In the present study, seven natural compounds, namely didymin, retusin isoquercitrin, silymarin, verbascoside, teucroside, and 3′-O-methylhypolaetin 7-O-[6′′′-O-acetyl-β-D-allopyranosyl-(1→2)]-6′′-O-acetyl-β-D-glucopyranoside were isolated from Mentha spicata, Sideritis libanotica linearis, Platanus orientalis, Teucrium chamaedrys subsp. chamaedrys, and Silybum marianum. The influences of compounds on the carbonic anhydrase I(hCAI) and II(hCAII) purified from human erythrocytes were tested. Five phenolic compounds acted as an inhibitor on the activity of hCAI, and IC50 values were computed between 18.16 and 172.5 μM. Isozyme hCAII is only inhibited by silymarin with an IC50 value of 43.12 μM. This isoenzyme was effectively activated by five natural compounds with AC50 values in the range of 2.98–18.53 μM. To understand the binding patterns of molecules that show activation effect against hCAII, molecular docking was done using Leadit 2.3.2 software, and calculated between −19.05 and −14.42 (kJ/mol) binding energies. Both in vitro and in silico results demonstrated that the best activators against hCAII were teucroside and isoquercitrin, with AC50 values of 2.98 and 3.17 μM, and binding energies −19.05 and −18.01 (kJ/mol), respectively. According to the ADME results, retusin demonstrated physicochemical and pharmacokinetic properties specific to the drug candidates. The online version of this article ( https://doi.org/10.1007/s00044-019-02329-1) contains supplementary material, which is available to authorized users. This research was financed Cankiri Karatekin University (Project No: BAP 2012-13).